I'm speechless, but know that I'm in awe. You are my hero. Oh WOW, it's like your nails are porcelain! Absolutely stunning... you inspire me, girl! I love this idea. Such a simple concept that really looks amazing. Great job! 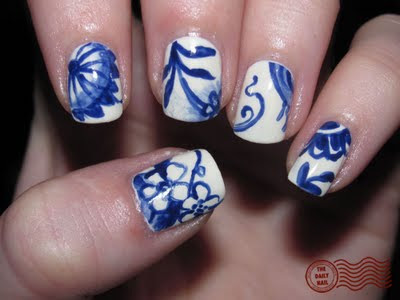 Girl, these remind me of Delft! So pretty! Outstanding! Your ability to produce miniatured artwork using a medium designed to dry rock hard in minutes continues to impress me. wow these are so pretty. defiantly looks like china.. the blue is the perfect shade. 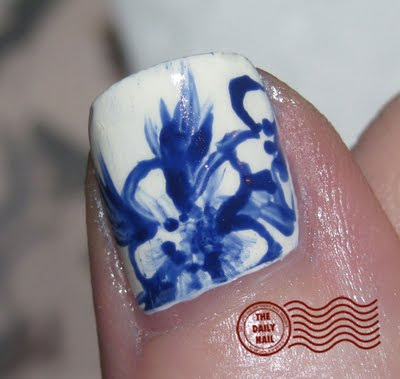 and on another note you have completely inspired me to get into nail art. I haven't tried much yet. just some paw prints (im a vet nurse so it was cute) I even brought some Seche Vite.. im not as happy with it as i had hoped. maybe im putting it on to thick. Very lovely designs and colors. Really pretty, thanks for showing! That's amazing! I wish I could do that. Great blog. New follower. Hope you follow back. Amazazing! Out of this world ideas that are so wearable. It would be an honor for me to have you follow my new nail blog. Please comment weather good or not so. OMG! You have a major contest winner here! You instantly transported me to my best friend's house with the pictures here. Her entire house is full of Danish cobalt blue & white dishes - the really old, antique good kind. This is one of my fav nail arts yet I think! We're very happy following viewed your blog, the pictures involving arms using coloured fingernails or toenails are too very good to see. Thank you for this specific submit.